\Programmes\Peace Support Operations\First COMPREHENSIVE GENERIC TRAINING ON PEACE OPERATIONS (CGTPO) COURSE started on Monday! First COMPREHENSIVE GENERIC TRAINING ON PEACE OPERATIONS (CGTPO) COURSE started on Monday! The first Comprehensive Generic Training on Peace Operations (CGTPO) Course in Serbia started on Monday! Its aim is to prepare civilian experts for partaking in multinational operations. ISAC Fund joined together with the Ministry of European Integrations, Ministry of Defence and Ministry of Foreign Affairs in order to build a system for sending Serbian civilian experts to multinational operations. These efforts have been crowned this year by the first CGTPO course. The “Action Plan for Developing Civil Contributions of the Republic of Serbia in Multinational Operations led by the European Union, Organisation for Security and Cooperation in Europe and the United Nations” was adopted at the Government session on June 28th, 2018. Serbia thereby confirmed its readiness to fulfill one more obligation stemming from Chapter 31 and to join those countries that strive to build global peace by civilian expertise. Serbian soldiers (Representatives of the Serbian Armed Forces) have been proving our commitment to peacebuilding within the UN and EU led missions for 16 years, and soon Serbian civilian representatives will be enabled to join them. This course represents one of the main preconditions for civilian experts to enter the roster for sending to the multinational operations. Beside ISAC Fund, the course is supported, financially and with expertise, by the Czech Development Agency, Prague Security Studies Institute (PSSI), Federal Republic of Germany, German Center for International Peace Operations (ZIF), Sant’ Anna School of Advanced Studies from Italy and OSCE Mission to Serbia. The course is held at the Peacekeeping Operations Centre (PKOC) and Multinational Operations Training Centre of the Serbian Armed Forces. 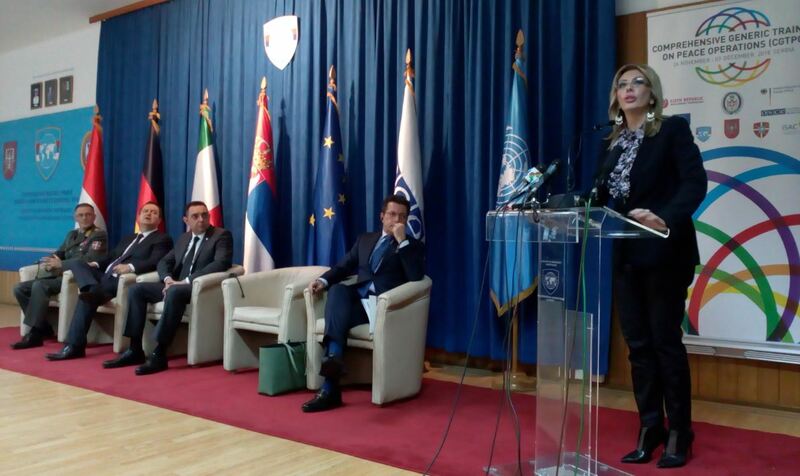 In order to emphasize the importance of development of these capacities for Serbia, the course was jointly opened by the First Deputy Prime Minister and Minister of Foreign Affairs of the Republic of Serbia, Ivica Dačić, Minister of European Integration, Jadranka Joksimović, and Minister of Defence, Aleksandar Vulin, in presence of the Chief of General Staff Gen. Milan Mojsilović, Ambassador of the Czech Republic, Tomas Kuchta, and Head of the OSCE Mission to Serbia, Ambassador Andrea Orizio, with many other guests and associates. The first pilot course will run from November 26th until December 7th.